Time to update your balance. In Part I of our tutorial, you discovered how to use the DSLA token sale dashboard on Stacktical.com to purchase your DSLA tokens. 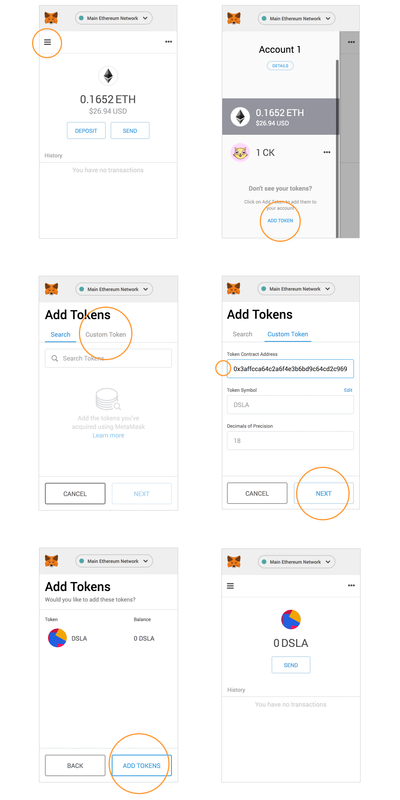 In Part II, we explained how to configure a cryptocurrency wallet and send ETH from your MetaMask wallet to the DSLA Token Sale Smart Contract address. In this final part, we will explain how to access and display your DSLA token balance on your ERC-20 Ethereum compatible wallet. Even if they might not be displayed yet, if you have participated in the DSLA token sale, if you are a Bounty Hunter or if you have won one of our Contests, chances are that you have already received DSLA tokens. Since the lock-up period is over, you might also received tokens from an acquaintance. Here is how to proceed using Metamask but process should be similar on other ERC-20 compatible wallet. Take good note of the DSLA token avatar as well (feature not available on all wallets). 👉 We highly suggest you read the manual of your wallet about how to add and remove custom ERC-20 tokens from your list of assets. Why are there multiple DSLA tokens on Etherscan? Etherscan is the leading tool for exploring the Ethereum blockchain and access information about its transactions, smart contracts and tokens. Token smart contracts are open source, so anybody can access and use them as they see fit. That includes deploying their own version of DSLA to the blockchain. But of course, only the official of the DSLA token located at 0x3affcca64c2a6f4e3b6bd9c64cd2c969efd1ecbe has a utility on the Stacktical platform, and will be listed on cryptocurrency exchanges. Why have I received DSLA tokens twice, from two different sources? If you have received DSLA tokens multiple times, make sure you only keep the DSLA tokens from the 0x3affcca64c2a6f4e3b6bd9c64cd2c969efd1ecbe sending address. ⛔️ Do not send DSLA to incompatible exchanges ! The DSLA token is not official listed on any exchange yet (but it’s coming) so never send your tokens to an exchange wallet. You will lose all your DSLA tokens if you do that and we won’t be able to do anything about it. You should be all set and ready to start your DSLA journey. Stay tuned for listing announcements. For now, you can freely transfer your DSLA tokens to the ERC-20 wallets of your family, friends and other acquaintances. Just make sure that you never send DSLA to malevolent parties and exchanges where the DSLA token isn’t officially listed. We have tried to make our tutorial as much informative as possible, should you have any question, our team will be happy and ready to help at tokensale@stacktical.com.